STATEN ISLAND, N.Y.-Thousands of people turned out Aug. 23 to protest police officers’ July 17 smothering – officially ruled a homicide – of Eric Garner, an unarmed African American man, as well as a spate of other killings by police around the country. The marchers, from all five New York City boroughs, called for reforms in the process of disciplining police officers who use unlawful force, and in police officer training. They demanded jail time for Daniel Pantaleo, the officer who allegedly killed Garner with a choke hold. Staten Island is not known for large demonstrations or progressive politics. Nonetheless, the majority of those who marched were from the island. From Bay St. and Victory Ave., the march continued into the rapidly gentrifying Saint George neighborhood, the bay for which the street is named and Manhattan’s majestic skyline in the background, on to the office of Staten Island district attorney Daniel Donovan, Jr.. Donovan has summoned a grand jury to decide whether to bring charges against Pantaleo. The protesters demanded that someone else lead the prosecution, suspecting that Donovan will let the officer off with a slap on the wrist. 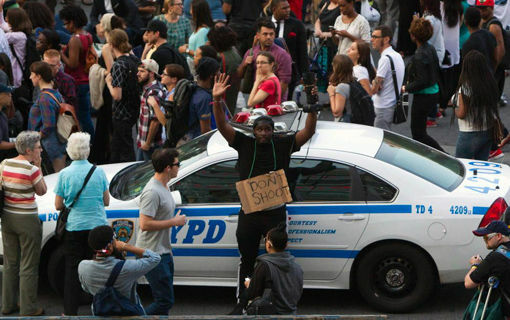 Demonstrations will continue “until someone goes to jail,” former New York Gov. David Paterson, a Democrat, told the crowd. Paterson listed more than a dozen deaths of innocent people at the hands of the NYPD in recent decades. The mothers of some of these victims, including Amadou Diallo’s, joined Paterson on stage. “Hands up, don’t shoot,” demonstrators chanted, holding their hands in the air as they marched past the Tompkinsville neighborhood spot where Garner was killed. The chant referred to police shootings of unarmed people, especially African Americans, sometimes with their hands up, sometimes in the back. Sharpton, Paterson, and nearly all other speakers emphasized that the rally was not anti-police, only anti-police brutality. Sharpton even thanked police on duty that day for logistical help. This did not keep the New York Post and other media, however, from referring to the rally as “anti-NYPD.” The same media also created tension by spreading rumors that the rally would turn violent. It didn’t; not a single arrest was made. Aside from Sharpton’s National Action Network, organizations at the march included the NAACP, the United Federation of Teachers, the Working Families Party, SEIU 1199, churches, immigrant rights groups, and others.